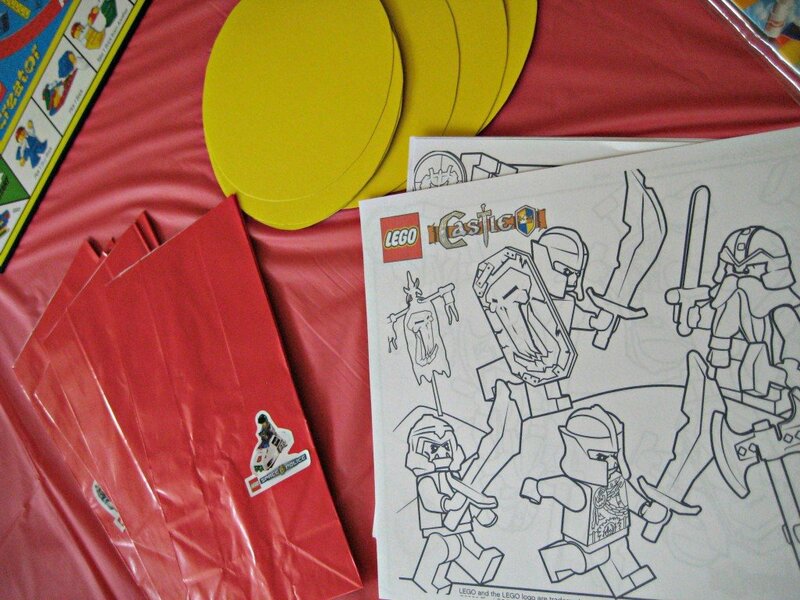 Time for a Lego Birthday Party! So many kids spend years and years in love with Lego. It makes sense to throw a frugal, fun birthday party around this classic toy. It was the perfect theme for my son’s 6th birthday. Decorating was easy! I used a game board from Lego Creator, a game I picked up last summer at a yard sale for $1.00. I filled a yard sale vase with Lego for a great centerpiece. The lovely plastic tablecloth was from the Dollar Tree. I also bought a bag of balloons there. I made a cute banner with regular construction paper. I just cut some rectangles, punched some circles with a circle punch, and the toddlers helped me glue them down. I glued them to a piece of ribbon–easy decor! Now that it’s down from the dining room, it’s hanging in my son’s room. He loves it! While we spent a lot of time just building Legos on the floor, I also had some planned games and activities. 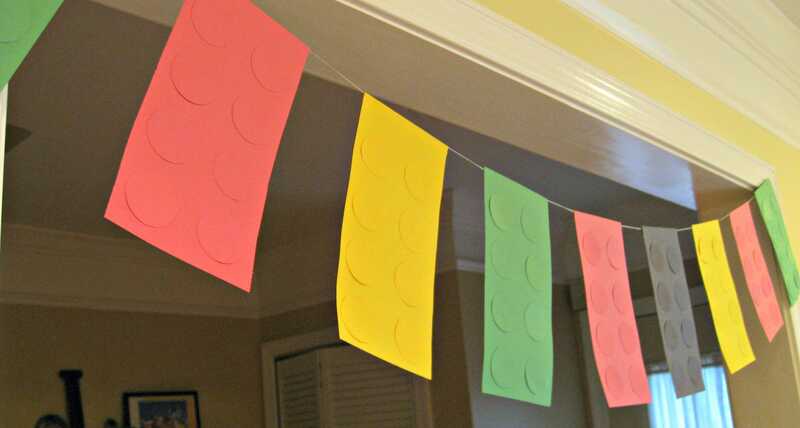 I used a piece of posterboard, .99 at CVS, and made a “Pin the Spot on the Lego” game. 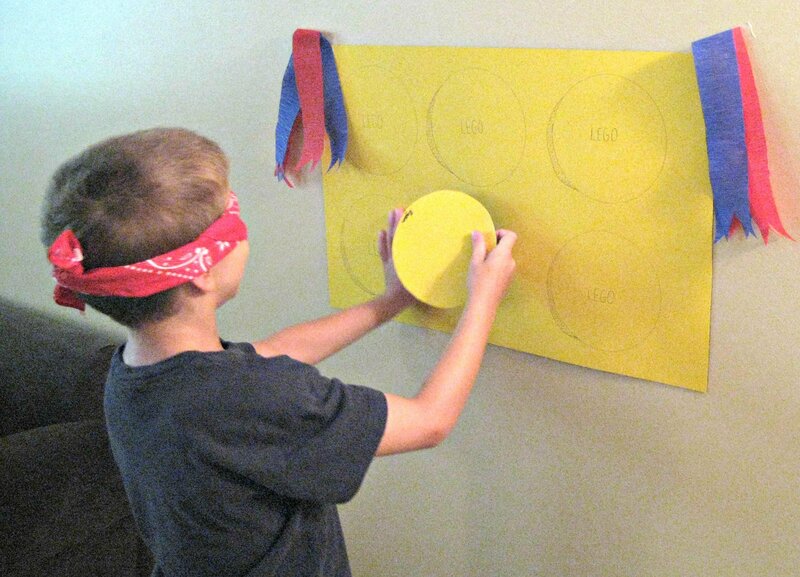 We blindfolded each boy, spun them, and they laughed at each attempt to find the missing spot. They also cracked up at a simple balloon game; we blew up about 15 balloons and left them on the floor. One at a time, each boy had 30 seconds to pick up as many as they could. It was hilarious; the more they held on to, the more the balloons would shoot away. I printed some coloring sheets from Lego.com, and that got the boys to calm down and sit at the table while we got the cake and ice cream ready. And the cake…the piece de resistance. I always bake my kids’ cakes or cupcakes. It’s a memory I have from my own childhood; my mom always did for us too. I used two boxes of cake mix, made six cupcakes and split the rest between two 9×12 pans. My son asked for red frosting, but I was afraid the Wilton food coloring would be too red, looking too much like blood. I talked him into blue, and what won him over was the promise of green poop for a day or so after the party. And, yes, that really does happen. For the party favors, I bought brick candy from a candy store at the mall. It tasted pretty awful, like low-quality Sweettarts, but they did actually stack and stick together. 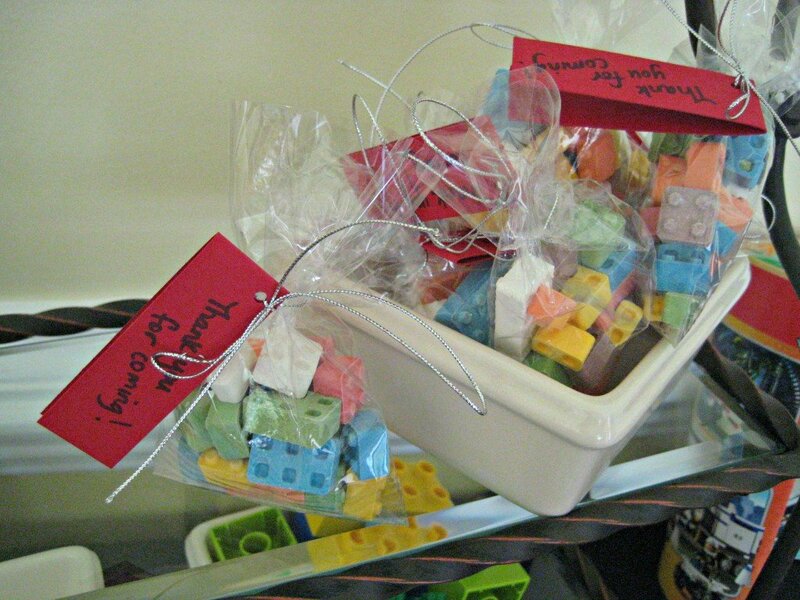 I used some baggies, ribbon and cardstock for “Thanks for Coming” favors to hand out as guests left. 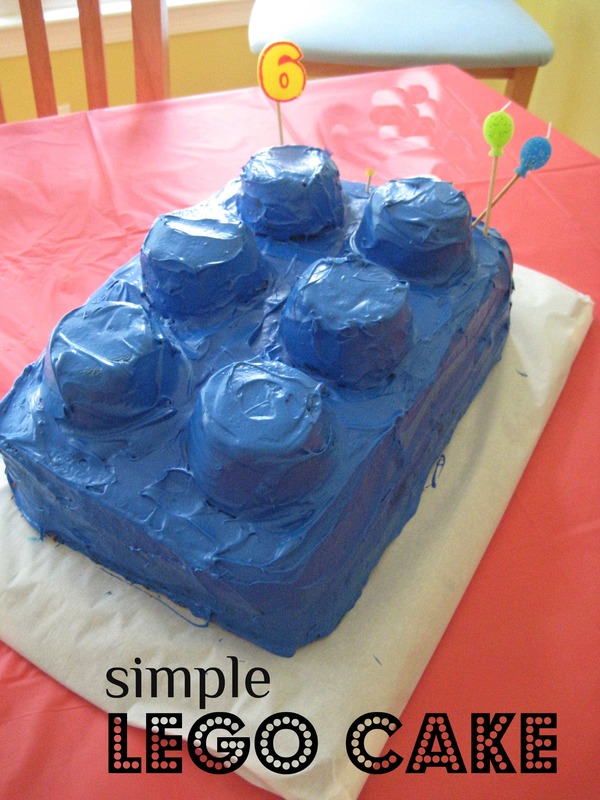 This Lego Birthday Party was a hit (and very frugal). My son was thrilled with his gift from Mom and Dad: a ginormous Lego set (that I would never buy in a store), bought for FREE with Amazon GCs I’d been saving up from Swagbucks. Happy 6th Birthday, big guy! Great job Gina! I'm a big fan of "home made" birthday parties (which seem more like a rarity these days!). Yours sounded pretty cool! If any of my boys end up LEGO obsessed, I'll have some great ideas! Cute! I try to make my son's cakes most of the time – I did a pirate ship one year and I thought it was too cute! I saw a make-it-yourself lego costume in one of my magazines. That's pretty awesome, Gina – way to go! 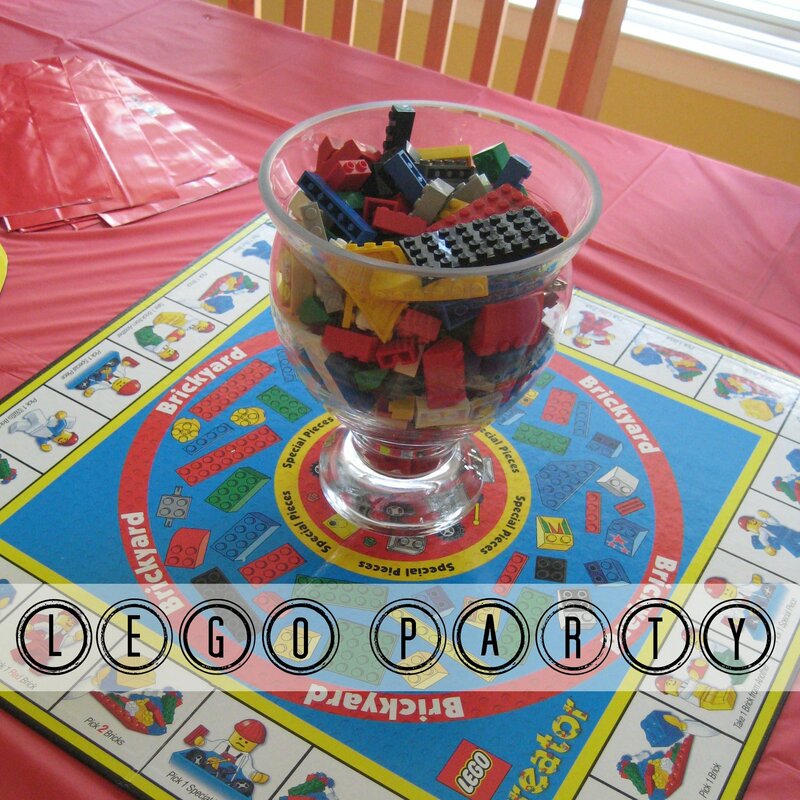 I absolutely love the cake and everything you did to pull together a lego-themed party. When my son is a little bit older I may borrow some of your ideas for his own Lego-maniac party! Thank you so much for posting about it; you are incredibly talented with crafts and all the little details that go into planning a little kid's birthday party. I bet your son and his friends had a ball! I threw a Lightning McQueen birthday party for my son back in June. It's so much fun making your own cake and planning all the special details! I love it! My son is turning 6, too, next month. We did pirates & princesses last year, but the lego theme is perfect for my lego-obsessed boy. Definitely, home parties are the way to go. It's ridiculous to spend $300+ for a kid's party at the local play spot (besides, those jumping things scare me). Hi Gina! You did a great job! I will have to do something like that for my husband's birthday in October! He LOVEs LEGOS. HAHAHA! My son was a Lego fanatic, too. This birthday party was definately a hit. All the decor and cake are very nice. It is not what you spend, but the memories of your son's childhood is what he will remember the most! I love it! Great job! 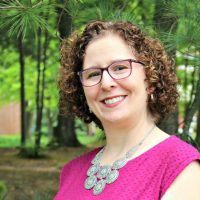 Can you give me you email address via Twitter/ or sign up at Party Planning Professor for link love and I will deff love to put this in the Party Planning Professor database! Your an awesome mom and yes I totally agree homemade parties are so much better sometimes. Love love love it! All of it! Your such a good mom.